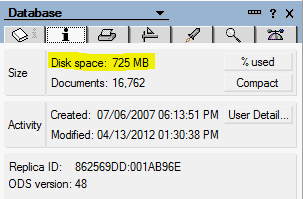 In Lotus Notes – Choose File, Application, Properties as shown below. 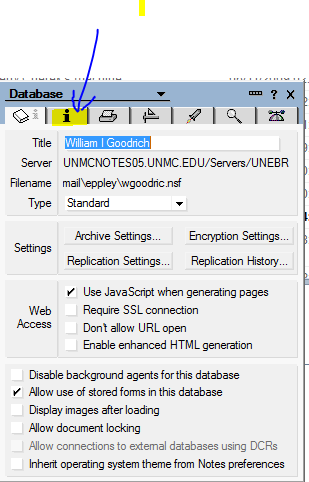 If you don’t have an icon for Onechart on your desktop yet, you can follow these steps to manually setup your computer for OneChart. 5. Run it. There may be a long pause before you see anything happens. Then you should be ready to go. Book mark this page, so you can get directly to this point later. This is essentially where the icon on the desktop goes. UPDATE Note that while campus ITS is making every effort to fix the speed issues with off campus access, they have given us a temporary workaround. 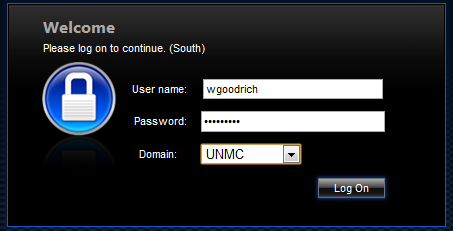 When you go to the secure.unmc.edu/unmc page, click where it says HERE to go to the OWA. Background: We’ve had a number of questions and comments on how slow it is to connect from off campus to the email system. There’s good news and bad news…. The good news is, it wasn’t you. The bad news is that there is something wrong with the off campus access and they are trying to fix it. I know it wasn’t the email server itself because I answered 8 emails from my phone while I was waiting. Hopefully this will be resolved quickly. A new tactic for moving your personal contacts that speeds up the process. Then in OWA, when you receive the message, you will see all their corrected email addresses at the top of the mail. Adding a contact from that list is as simple as right-clicking and choose, add to Contacts, then Save and Close in the Box that appears. If they are an off campus contact, you would still want to add their name as you want it to appear, but on campus individuals will have all the fields populated for you. Why do I still get emails in Lotus Notes instead of the OWA? Until changeover occurs, all email addressed to you will still arrive on the Lotus Notes server and be available in the Lotus Notes email. We have 119 people who have confirmed they are able to login and 104 people who either cannot login, haven’t let us know they can or who don’t have an email account. People are using OWA and we’re glad to see that. It will be so much easier to transition on March 6th if you are familiar with it. Remember, that if you send email from OWA it will go to that person’s Exchange account… and they may not be using it yet. Happens in Vegas – Stays in Vegas ? Delete all mail that isn’t necessary from your Lotus Notes Email (Believe me, it’s there) I’ve reduced my email account size by half over the last couple weeks. I’m far from done, but I realized that there is a lot of senseless junk out there. Did I mention Stop panicking ? After you’ve familiarized yourself with the new account, look at whether there are some emails you still need to keep a record of. Keep in mind that email was not ever meant to be a file cabinet and it still is no substitute for one. If some emails are found that need to be kept, you can forward them from your notes account to your exchange account. We will share directions for this later as the instructions will change as the go-live date approaches. Please keep in mind that Wally and I are not email administrators and that we’ve only had the new email system for a couple of days too. We don’t know all the answers yet. Please wait until you hear the answers from us if there is a doubt. For example: Campus is telling users that they cannot use multiple calendars with OWA. This is not true and we are still trying to get campus to properly support the new email system instead of making it a royal pain like Lotus Notes. Campus is also telling users there will be a new icon for outlook appearing on their desktops. In the event that icon appears, don’t use it. We are not supporting email that way at Eppley. Further, don’t try to setup Office Outlook, Outlook Express, etc. as that’s working contrary to our plan to have everyone working efficiently. 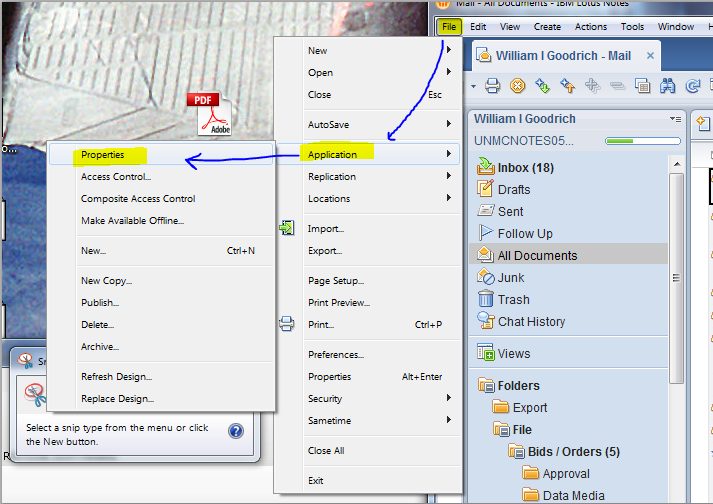 It may also, change your system defaults so it no longer opens lotus notes when you click on an email address. In the event that AFTER using our system for two weeks, you feel there is something that requires a change. You may submit your justification to see if there is a way your issue can be resolved. It’s taken 15 years to learn to do things the way they are now. Let’s give the new system an honest effort. By utilizing the OWA for our email system, our email will be available everywhere on almost any computer with the same interface. This will make it much easier for you and us as we move forward.